Important information for students from UC staff. Dr Geoffrey Rice’s latest book That Terrible Time: Eye-witness accounts of the 1918 influenza pandemic in New Zealand, is due for release on Friday 23 November. New Zealand’s worst public health disaster occurred in November 1918 when around 9,000 people died in the so-called ‘Spanish’ influenza pandemic. when the victims’ bodies turned black. That Terrible Time has many moving and memorable human stories describing how New Zealand coped with the 1918 flu. Amidst the horrors of victims’ bodies turning black from cyanosis, there are some amusing episodes when people could not help seeing the funny side of a grim and terrifying time. Dr Rice’s books published previous to That Terrible Time included brief excerpts from the many interviews and letters he had gathered in the course of his research, but this collection includes many that have never before been published, and longer extracts from those that have. Emeritus Professor of History Dr Geoffrey Rice (Alumnus 1965) has had a busy year helping to mark the centenary of the great influenza pandemic of 1918. Following the publication of his book Black Flu 1918: the story of New Zealand’s worst public health disaster (Canterbury University Press, 2017) he was invited to deliver keynote addresses at international influenza conferences in Madrid, Singapore and Melbourne. The NZ Ministry of Health invited him to address meetings of senior managers responsible for implementing New Zealand’s Influenza Pandemic Plan and he also spoke at a national civil defence conference in Wellington. In addition he has delivered over 30 talks about the 1918 flu to various U3A, Probus and genealogy groups in Christchurch, Wellington, Nelson and Timaru. The introduction in That Terrible Time explains how he first became interested in the subject, and the research that led to the publication of Black November in 1988, and its expanded and updated second edition in 2005. This book remains the world’s only country-level study of the 1918 flu based on individual death records. Professor Rice’s mortality data has been used by researchers at the Wellington clinical school of the Otago Medical School for a series of articles in the New Zealand Medical Journal. His own article on influenza in New Zealand before 1918 was recently published in the prestigious American Journal of Epidemiology. 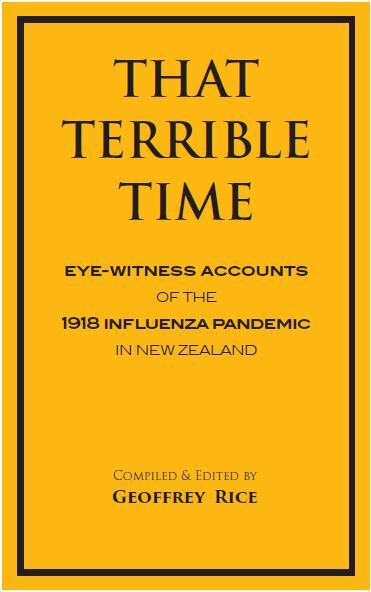 That Terrible Time: Eye-witness accounts of the 1918 influenza pandemic in New Zealand is available from the distributors, NATIONWIDEBOOKS.CO.NZ, at $24.99. He has done it again! UC academic, teaching and wellbeing champion Associate Professor Ekant Veer won New Zealand tertiary teaching excellence honours in a ceremony at Parliament this week. Associate Professor Ekant Veer of the Department of Management, Marketing and Entrepreneurship received a Sustained Excellence award from Ako Aotearoa National Centre for Tertiary Teaching Excellence.